The snail family is quite large. There are 4000 different species, 400 of them in Europe. Their life in the wild depends on the seasons, since snails are born in the summer and grow until winter, when they hibernate. Snails are curious animals, not only because of their shell and four pairs of tentacles, known in Spanish as “cuernos” (horns). Did you know that the head contains not only the mouth, but also the genital opening? They are hermaphrodites; each individual acts as a male or as a female. This is why when they mate, beginning at 4 or 5 months of age, it is necessary for two individuals acting as different sexes to meet. Mating, by the way, takes an average of twelve hours. The individual that has acted as a female will later lay between 80 and 120 eggs. Humans have included land snails in their diet since the origins of man. The Greeks and the Romans were great consumers, and snails are part of the traditional meals of many countries, including Spain. Their culinary qualities are much appreciated, and their nutritional level is outstanding. Snail meat contains low levels of fat and cholesterol and high levels of minerals and proteins and provides most essential fatty acids. Farm-grown snails have a lot of flesh, with 30% more muscle compared to wild snails. Their meat is white coloured and with a turgid texture. Nowadays, apart from the flesh, which is also used to make pâté, the eggs are also sold as caviar. 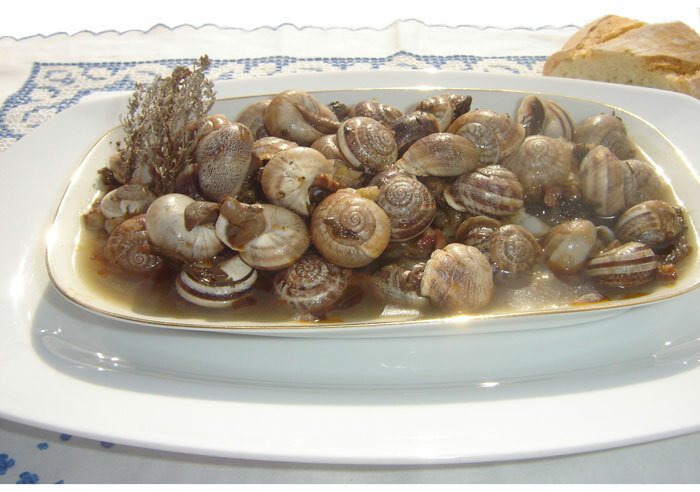 Although there are no official statistics on the quantity of snails eaten in Spain, it is estimated to be approximately 14.000 metric tons. In the last few years about a third of this amount has needed to be imported due to consumer demand. Spain is the second world importer of snails, after France, which leads the world in snail consumption and multiplies Spain’s by four. The increase in consumption has aided the growth of artificial breeding. Snail farms, which concentrate on breeding two species belonging to the Helix family, aim for two reproductive cycles a year so they will always have snails available. There are 150 snail farms in Spain nowadays, up from twenty-five in the year 2000, although many of them have failed, especially due to marketing problems. It is a growing sector, but with many difficulties. In the first place, and as with other alternative products, no specific development plans exist. Unverified information appears sporadically on the news, especially reports that exaggerate the economic impact of this activity, or that explain erroneous breeding methods. Besides, farms that grow snails are not subject to specific regulations and there is practically no legislation concerning their marketing. Farm-grown snails cannot compete in price or quantities with snails gathered in the wild, although they are able to compete in quality. The problem is that it is calculated that the wild snails that are distributed without being previously subjected to health controls amount to two thirds of the total consumption of snails. In many towns it is traditional to sell them in markets and street markets. But this poses two doubts: in the first place, is gathering wild snails allowed? Apart from some autonomous communities that have enacted legislation to protect a particular species, the Spanish national statute for the protection of wild plants and animals does not expressly regulate the capture of snails, since they are not included under any of the protected categories. However, national legislation does ban the capture of wild animals in general. But the section on infringement does not include cases where the species is not catalogued. The truth is that, in practice, gathering wild snails has always been allowed. Once we have studied the part about gathering them, is it legal to sell wild snails? No, if they are not marketed by approved establishments, although this is not frequent in reality due to the negligence of the different government bodies. This means that wild snails are some of the least controlled foods in Spain, which is incomprehensible given that food safety measures are continuously being updated. Wild snails are exposed to toxic products used in animal and vegetable farming, and may pose a hazard for final consumers. This is why it is necessary to regulate the control of snail consumption and to guarantee that all of the snails put on the market have passed a health inspection.